is probably not the first word that comes to mind for most people when it rains. then maybe you'll understand why I think of it this way. I have been reading and enjoying your comments. When I'm back home, I will have more time to visit and get caught up with you. Enjoy your trip. I love the sound of the rain and thunder on your blog, it reminds me of long ago summer days. Gorgeous! I especially love the ones with the pretty green patina. Becca, I have never seen nor heard of anything like this, and I LOVE it! Off to read your post about it, and I sure hope the weather clears for you soon! Stunning photos! I want one of those as well!! Not sure where hubby would let me put one since we try to keep the moisture WAY AWAY from the foundation of the house. These are fabulous! I love them. Great sound effects today. Love the rain chains. I love coming to your blog, Becca! It's so peaceful and calming. And, you have great art! Glad I found you. Rain chains. Hmmmmm. This is new...I like! Thank you Miss Becca for visiting me today and your encouraging and sweet comments as always. And even while you are away in Seattle (lucky you). I have always wanted to see Seattle. My husband has been there on business, but I have not been. Some day! Have a wonderful time away! PS: How lovely your new profile pic is! Hey girly, I do hope your having a great time. 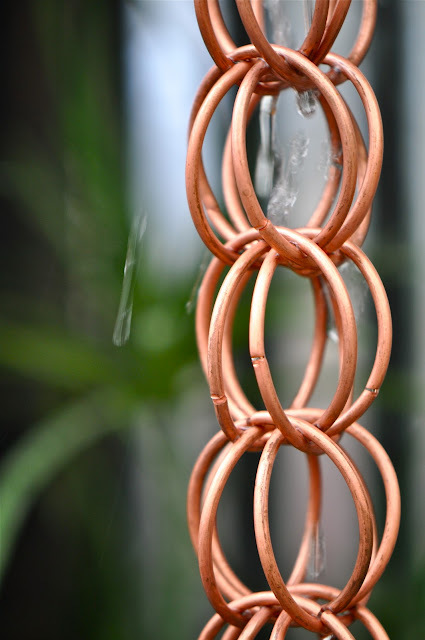 finally a rain chain with a purpose.. Hee Hee... They look wonderful.. Hey I love your photo.. looks great!! These are beautiful, Becca! I think I will have to add one to my garden next year! Your blog looks so wonderful...and I love your new photo~ you are so pretty! I wish that I had one of these yesterday because it was pouring rain here. They are beautiful. These are so beautiful! And Yes, they are art! So you are having a wonderful time, and yes the rain has held off a little in honour of your visit. Round here, in the Wet Coast, we think of rain chain, as days, and days, of constant rain. The novelty is worn thin here.....LOL. Oh the water sound did get me as I was listening to a podcast and thought the person being interviewed was very rude to be making tea - lol. 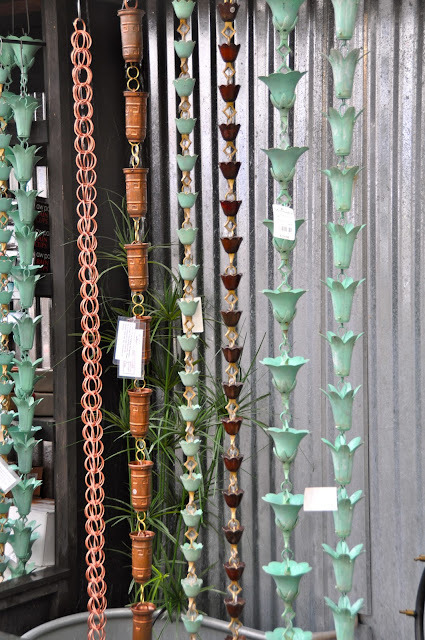 These aArt rain chains are so beautiful - what a lovely idea. these are such beautiful, unique shots. I love the first one! I've had such a lovely little visit! Your kitten is ADORABLE (I'm sure you're completely surprised by this news! =D) The 'story' of the kitten meeting your two other cats is so cute! I just want to tell you that your autumn colors - the colors of all of your crafts and photos - they're so beautiful! I love color so much and it's been very refreshing. A feast for the eyes! Hope your trip is everything that you need and want it to be and more! I would love to try one in my garden, they look so neat. Lovely shots Becca. I hope you have a wonderful week, my dear friend. I love these rain chains Becca!!! Your new profile photo is just gorgeous!!! It has not rained that much here which is quite unusual for November. We move in less than 2weeks and I am working way too much!!! When is your birthday??? I hope I didn't miss it!!! I love that owl on your last post! I love these rain chains, I haven't seen a lot here which is odd because it rains a lot here (especially this time of the year). Es precioso me gustan todos y sobre todo el sonido del agua y la lluvia,me relaja mucho,en parte tambien soy como una niña pequeña que le encanta la lluvia y su sonido,estos dias aqui en Barceloa ( españa ) esta lloviendo sin parar y me encanta ese sonido. Fun! I'll bet Lucy was glad to have you back home. Those rain chains must have come in handy today! And there was frost on our n'bor's roof this morning. BRRRRR! I've never seen these before, I love them! the water looks amazing on them and beautifully photographed. Some great images! AND, the sound is much more pleasing than the music some sites force on us - besides, I live in Seattle, so these sounds are all to familiar! Thanks for the visit. I haven't heard of rain chains before...thanks for the tip. And I hope you're enjoying your travels. These are fascinating Becca...and beautiful too. I would love one! I love the idea of the rain chain rather than a downspout from the gutters.